Unbeatable as a team: ZENTREX 6215, DYNESTIC 7532 and the STORE-MASTER 5110 plate storage system for the first time at LIGNA. A flexible, future-oriented system solution for high-performance plate handling and the associated significant increase in capacity and profitability of your business. An important highlight: automatic labelling with the power label directly on the lifting table of the nesting processing centre. The modern STORE-MASTER panel storage solution from HOLZ-HER enables an innovative storage design and is adapted to your given space conditions. Computer-controlled, the panel manipulator picks up the correct panels and places them on the pressure beam saw or nesting machine for further processing. 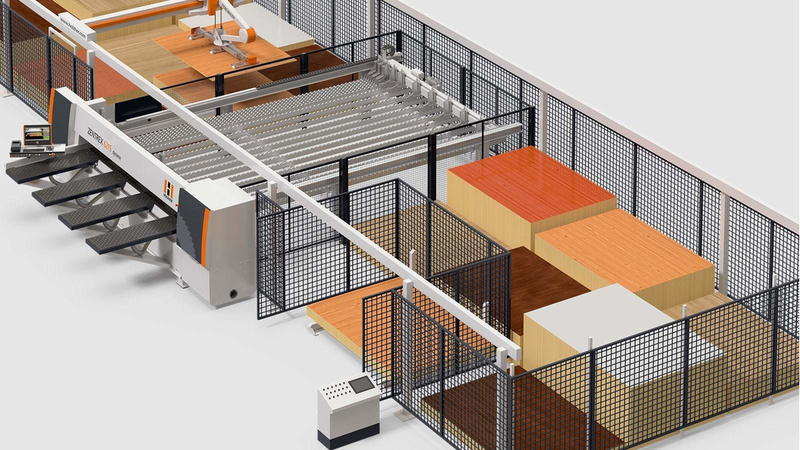 In this combination - with pressure beam saws and nesting CNC machines - this intelligent system guarantees highly efficient work in all batch sizes and thus a perfect solution for all company sizes. Production processes are optimized through digitalization, thus ensuring maximum transparency and added value. You can view your stock of materials at any time at the touch of a button, so you can take inventory immediately. In addition, you automatically increase your production capacity and personnel and organizational effort are reduced to a minimum. And you also make optimum use of the available space. You will be convinced by the gigantic increase in productivity due to the optimal utilization of your machines!